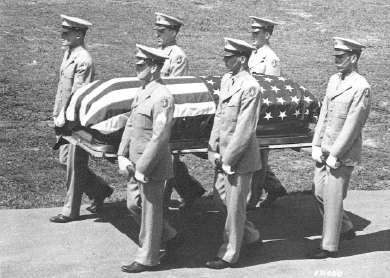 On June 4, 1948, two members of the 442d who had died in the Vosges mountains finally came home to America. The bodies of Fumitake Nagato and Saburo Tanamachi were transferred to Arlington National Cemetery from the American cemetery at Épinal, France. In the 84-year history of the Arlington cemetery, they would be the first persons of Japanese ancestry to be buried there. There is one supreme, final test of loyalty to one’s native land . . . readiness and willingness to fight for, and if need be to die for, one’s country. These Americans, and their fellows, passed that test with colors flying. They proved their loyalty and devotion beyond all question. They volunteered for Army combat service, and they made a record second to none. In Europe, theirs was the combat team most feared by the enemy. In the Pacific, they placed themselves in double jeopardy, chancing the bullets of friend as well as foe. Everywhere, they were the soldiers most decorated for valor, most devoted to duty. Their only absences without leave were from hospitals which they quit before they recovered from their wounds, in order to get back into the fight for what they knew to be the right. These men, to two of whom we pay our heartfelt respects today, more than earned the right to be called just Americans, not Japanese Americans. Their Americanism may be described only by degree, and that the highest. The United States Army salutes you, Privates First Class Fumitake Nagato and Saburo Tanamachi. You, and you compatriots, will live in our hearts and our history as Americans First Class. On August 10, 1988, four decades after Nagato and Tanamachi were honored at Arlington, another ceremony took place in Room 450 of the Old Executive Office Building in Washington, D.C. The occasion was the signing of a bill, H.R. 442, providing redress to the 80,000 surviving Japanese Americans of the 120,000 who had been “evacuated,” “relocated,” or detained during World War II. On June 21, 2000, in a crowded reception on the South Lawn of the White House, President Bill Clinton awarded the Congressional Medal of Honor to “some extraordinarily brave soldiers” who “never did receive the honors they clearly had earned” more than a half-century earlier. Of the 22 belated recipients, 20 were Japanese Americans, all of whom had served with the 100th Battalion/442d Regimental Combat Team. Along with the single Medal of Honor awarded immediately after the War, Japanese American soldiers won a total of 21 Congressional Medals of Honor, 15 of them posthumously, for their valor in World War II.